Old Soul: Robert Stewart tells young musicians that they need to find out who they are within themselves before they even try to imitate jazz legends like Coltrane. With his baby face and Reggie Miller physique, 28-year-old Robert Stewart doesn't look like an old soul. 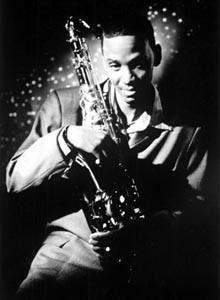 But when he puts his tenor sax to his lips, his fat, warm sound tells world-weary tales of jam sessions and juke joints. With at least three weekly gigs in different San Francisco clubs, Stewart is one of the busiest young jazz musicians in the Bay Area. Whether playing R&B in Oakland, his hometown, or laying down an irresistible groove with his organ trio at Bruno's, Stewart infuses his music with the kind of blues-drenched feeling that once turned Gene Ammons, Sonny Stitt and Stanley Turrentine into jukebox heroes. Stewart's first album, Judgement, came out on the independent L.A.-based World Stage label in 1993. In the Gutta, a raucous organ combo session on Qwest, put him on the blues map in 1996. With the release last month of his second album for Qwest/Warner Bros., The Force, Stewart's reputation is spreading well beyond California. A spiritually charged session at times reminiscent of mid-'60s John Coltrane, the album features local legend Ed Kelly on piano and, from the Branford Marsalis rhythm section, bassist Reginald Veal and drummer extraordinaire Jeff "Tain" Watts. After spending much of 1997 on the road with Wynton Marsalis, performing his epic (and Pulitzer Prize-winning) work on slavery, Blood on the Fields, Stewart returned to the Bay Area and resumed his local gigs, awaiting the release of his new album. I met Stewart one recent afternoon at First Stop, a Jack London Square nightspot where he frequently participates in the Sunday night jam sessions. Sipping a glass of orange juice as Joe Turner wailed Kansas City blues in the background, Stewart looked relaxed as he discussed his musical philosophy and his emergence as a force on the Bay Area jazz scene. Metropolitan: Your last album, In the Gutta, was a down and dirty blues session. With its calm spiritual vibe, The Force almost feels like it was made by a different person. Stewart: That's great. I wanted to do The Force because Islam is my background. I grew up in that kind of household, and I also had Christianity on my father's side. I did Judgement first--a little Latin, a little blues, a little of everything. In the Gutta was the first album I wanted to do for a major label, and Qwest popped up at the right time. The blues is how I started, around here at Eli's Mile High Club. That's kind of my foundation. Metropolitan: Do you get a chance to express your full musical personality working around the Bay Area? Stewart: I do really different types of gigs. At Pier 23 on Tuesdays, we go avant garde, and I can go out as far as I want. Wednesday nights I'm with Lavay Smith and the Red Hot Skillet Lickers at Top of the Mark, and that's the swing thing--Duke Ellington, Count Basie, Bessie Smith stuff. On Saturdays I've got the organ trio with Ed Kelly at Bruno's, so I get to do the funky Jimmy Smith/Stanley Turrentine kind of thing. I go through the whole history of the music in one week. Metropolitan: The Bay Area's been a hotbed of acid jazz and jazz/hip-hop experiments. Does that interest you at all? Stewart: I really don't get into terms, because I don't know what acid jazz is, I truly don't. For me music is just music, and if it expresses that person's individual psyche or they can get that across to an audience, it's cool with me. Metropolitan: When you were on the road with Wynton playing Blood on the Fields, how did that music hold up night after night? Stewart: One word: tiring. The piece is over three hours long, and we performed it almost every night. It's a great piece--provocative, with different moods and styles. But every night we'd have to try to figure out a way to keep ourselves involved, because some parts, it's just reading all night. It's really about discipline. We used to rehearse 13 hours a day, and then Wynton would want to go out and jam. I'm like, "Man, how do you do this?" He never stops. Metropolitan: You've had some strong relationships with veteran musicians. What's the best advice older cats have given you? Stewart: Whooo, man, I've got so much of that. Dizzy Gillespie told me to sing everything I play. He said if you sing it first, then you can play it. Eddie Harris told me, "Hit the groove and you'll work the rest of your life." Benny Golson and Eddie "Cleanhead" Vinson told me to learn the blues in all the keys. It was at the first jazz gig I ever saw. I was like, "Wow, I think I want to do this." And after the set, Cleanhead told me, "Yeah, junior, keep on keepin' on and play the blues in all 12 keys, and you got everything you need in music." Metropolitan: I've seen you here at the Sunday night jam sessions playing with some of the young musicians from Berkeley High. Have you found yourself getting into the mentor role? Stewart: The younger cats have started coming around at Pier 23, asking me how to do this or how do I think about music, and it's been great. You've got to have substance in yourself to be a musician. That's what I tell all young musicians: Find out who you are within yourself first, before you even try to imitate Coltrane or whoever, because you'll just be an imitation Trane. It's all about the individual, that's what jazz is all about. Another thing I tell them--you cannot escape the history. You can't just talk about Trane and Cannonball [Adderley] and Wayne [Shorter] and all. You've got to go back to Sidney Bechet, Coleman Hawkins and Lucky Thompson--those are my idols, man. That's why Wynton and I get along so well, we like that era. The only way I can play that stuff on The Force is by knowing the whole history.